The Ospreys player clearly collapses the maul by going to ground and taking the Edinburgh players feet with him. You don't need other angles for that. It's clear even though you can't see what's going on at that side of the maul? Says the guy who thinks Clancy was refereeing. In your defence they are both absolute Poopie refs. I used to love watching Clancy and Lacey. Luckless Pedestrian wrote: I used to love watching Clancy and Lacey. Channel 4 today announced that it will broadcast Ireland’s autumn rugby internationals for the next four years. The 2018 RBS Six Nations’ Grand Slam Champions face Argentina, the USA and current World Champions New Zealand in November and all three matches will be shown live on Channel 4. This is the latest rugby acquisition by Channel 4 which begins a four year deal to show live coverage of every round of Europe’s top club competition, the Heineken Champions Cup, this October. Joe Blake-Turner Channel 4 Commissioning Editor, Sport, said: “Rugby fans can look forward to a match up between the number one and number two teams in the world. The four-year deal includes: coverage of two of Ireland’s World Cup warm up matches in 2019 against Italy and Wales; 2020 autumn internationals against Australia, South Africa and another team to be announced; Ireland’s autumn internationals in 2021 against the All Blacks, Argentina and another country yet to be confirmed. Welsh games were on C4 I believe ? From memory our WC warmup games are now C4 - our summer tour games were. Welsh AIs are always on BBC Wales. I think that’s continuing. Haven’t heard that it’s stopping. And yes, summer tour was on Channel 4. In fact Channel 4’s first one was Wales v SA in USA in the summer. The USA filming of the game was hilarious! Camera man kept following the players without the ball! Not C4’s fault though I suppose. The Oracle wrote: Welsh AIs are always on BBC Wales. I think that’s continuing. Haven’t heard that it’s stopping. And yes, summer tour was on Channel 4. In fact Channel 4’s first one was Wales v SA in USA in the summer. The USA filming of the game was hilarious! Camera man kept following the players without the ball! Not C4’s fault though I suppose. Nope, the games in Argentina were much better. Anyone using the premier sports app and casting to a Chromecast? If so what's the picture quality like? 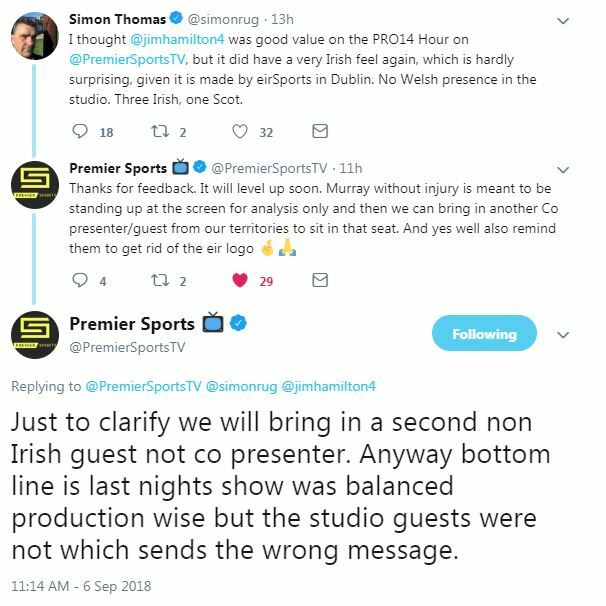 I didn't see the Premier Sports pro14 show last night. Anybody care to comment on it? carpet baboon wrote: Anyone using the premier sports app and casting to a Chromecast? I plan to, I know people who do it and they haven't any complaints. RugbyFan100 wrote: I didn't see the Premier Sports pro14 show last night. Anybody care to comment on it? Fairly Irish centric again, about half the show devoted to their teams but Murray's analysis was very good. Prem sports have said it will become more balanced and are looking into getting guests from different countries on. Thanks. Glad I missed it then. Still worth watching if you are fan of whomever an Irish team has played. Why? If you're such a big rugby fan why wouldn't you want to see it? I've got to say I've been impressed with their social media response - they're not shying away from things. RDW_Scotland wrote: I've got to say I've been impressed with their social media response - they're not shying away from things. Not really bothered if it's catering for a different target audience. Can't say I'm fussed about watching a 20 minute analysis of the Connacht back moves. Again..if you're such a big rugby fan why wouldn't that be of interest? Who told you the level of rugby fan that I am? So anybody that claims to be a rugby fan should want to watch analysis of teams they don't support? What an odd piece of logic you have there. Not surprising though. If you really want to bicker about anything I type Martyn, and chase me around these boards to argue that black is white, then I'm free all day - such is your obsession with me. I'm not busy. I suggest though, that the Moderators, and users of this board who actually want to see rugby union discussed would rather see something else. But go for your life. Jesus, will you two get it over with and bang already ? munkian wrote: Jesus, will you two get it over with and bang already ? You're obsessed with me. I'll take it as a huge compliment. I've no real interest in analysis of Irish teams unless it has context for me / my team. Maybe you can ask one of the Mods to alter my user handle to reflect this. 'PartTimeRugbyFan' isn't taken. Who cares ? What does your weird five knuckle shuffle bank points scoring have to do with the topic ? munkian wrote: Who cares ? What does your weird five knuckle shuffle bank points scoring have to do with the topic ? What does it have to do with him coming on complaining about the balance of coverage and basically saying too Irish for me? Really? Its literally do with the topic. Your calling it out as 'anti irish' when its not. It's people wanting fair coverage of the Pro14, granted some people have added more to the topic than others. He's saying he wouldn't want to watch analysis of Connachts backline moves but if they had what he perceives as balance these things are covered too so does that mean he'd never watch anyway? I neither know nor care, stop filling threads full of this garbage, just put him on ignore.